This book brings kids face to face with one of their worst fears: vegetables. Author, Danny Schnitzlein draws from his own childhood aversion to peas in order to create a story that helps readers to examine their own fears. 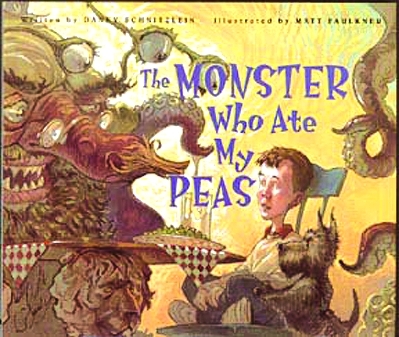 The monster that helps get rid of the main character’s peas soon asks for something in return: his dog. The boy must decide which is more important to him. Ask students to draw a monster that has never been seen before. Allow them to use markers, colored, pencils, crayons, pipe cleaners, buttons, pom poms, and glue to bring their monsters to life. Then, ask students to write a story about the monster they created. What is the monster’s name? Was it always a monster? If not, how did it become a monster? Is the monster really evil or does it just look scary? After they are done, let the students share the pictures of their monsters and give a summary of the monster’s background to the class. Click here for the full summary of The Monster Who Ate My Peas and here for the full teacher's guide.